EPIC 50% OFF Black Friday Sale + FREE $150 Amazon Gift Card & Master Club Giveaway! It’s the busiest time of year when traffic (on foot and online) come through your doors! 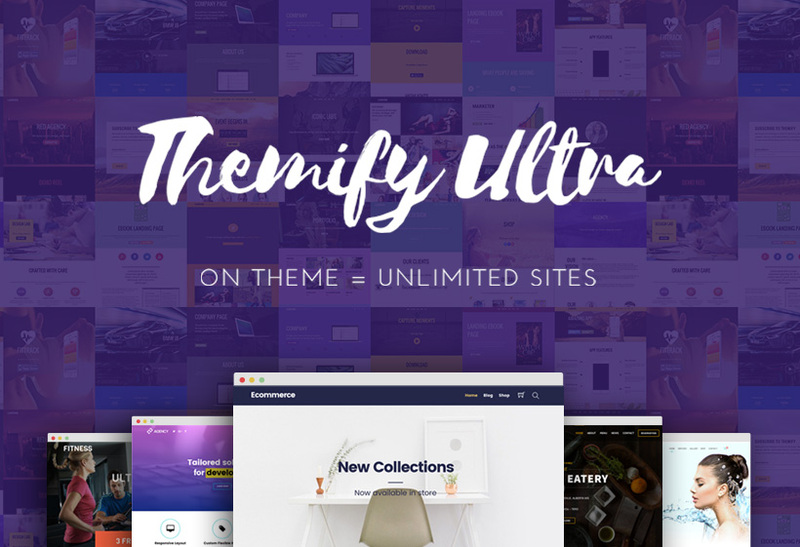 Make sure your website is glistening and gleaming by taking advantage of Themify’s biggest sale and giveaway! 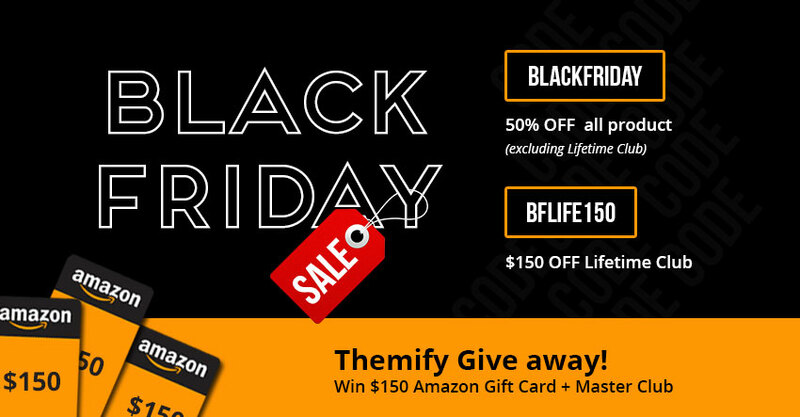 We want to celebrate and thank you all for another wonderful year with 50% OFF all Themify products (excluding Lifetime Club Memberships), $150 OFF the Lifetime Club Membership, and an amazing $150 Amazon gift card plus Master Club Membership giveaway! Read below for details on each promotion and how you can enter our giveaway. Take 50% OFF all Themify products! Yes, you heard us right – 50% OFF. This includes all plugins, Builder Addons, WordPress themes, and all Club Memberships (excluding the Lifetime Club Membership). Psst! You can even use this promo code for your membership renewals and upgrades! Use the promo code: BLACKFRIDAY to get 50% OFF now! We never like to leave anyone out so, for only the second time ever, we are offering a massive $150 OFF our Lifetime Club Membership. This exclusive membership will give users LIFETIME access to all Themify products, updates, and support. And for a limited time, it can all be yours for $249! This package is an absolute steal and comes highly recommended from newbies and veteran web designers alike! Use the promo code: BFLIFE150 and get the Lifetime Club Membership for only $249! You can enter our giveaway and have a chance at winning one of three grand prizes by submitting an entry below. Choose to either follow or tweet us, share this giveaway on Facebook, or comment on this blog below. To increase your chances, you can make one entry every day for the duration of the giveaway. The more entries, the more chances of winning a free $150 Amazon gift card + Master Club Memberships! This promotion and giveaway ends on Cyber Monday November 27, 2017 @ 11:59pm EST, so be sure to take advantage of this amazing deal now! The Themify Theme will allow me to express and convey myself easily without focusing so much on the design aspects of my website so that I can just focus on creating good quality content. I Know Themify will be able to make my vision a reality with all the available plugins and themes which is to help people navigating school and worklife more easily. I know I have a lot to offer to the world and Themify can help me express that not only visually but most importantly efficiently and effectively. I should win the giveaway because I don’t really deserve it. I’ve got everything I need and this would just be a way to buy more stuff that I don’t need, don’t have room to store and will probably just waste away sitting in a corner gathering dust. Thanks for the ability to win somethink! What an awesome giveaway! Good luck everyone, and thank you for the giveaway! I have used a few of your themes and plugins in the past, and love them all. It’s nice to have some sales and giveaways once in a while. Thank you! Awesome! I hope I win. I am trying to rebrand myself as a freelance designer and having a simpler way of doing websites would be such a big help!! Thank you for the chance to win! 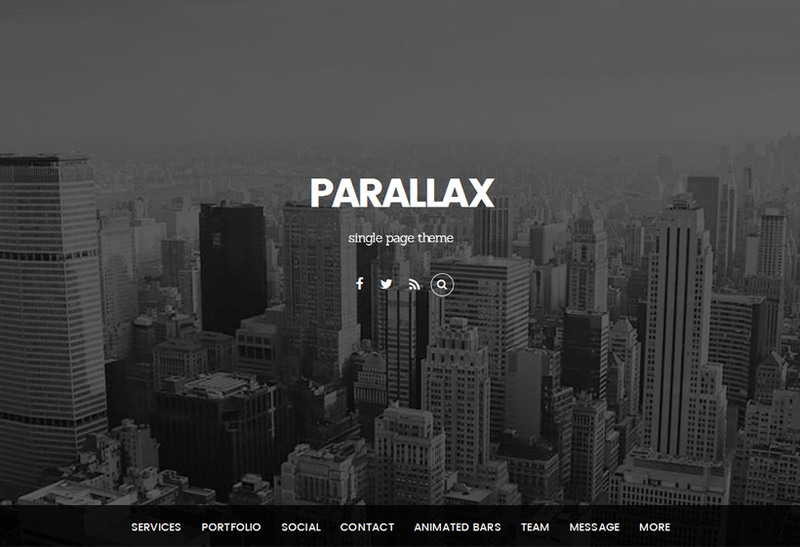 Premium and modern WordPress templates that leave your Website and your client beautiful and high performance. I always want! Everybody wants! Every year i faithfully renew my Theme because Themify updates and makes quality products. I would live to win the Lifetime license. I use themify several years ago and I am very happy with the improved products and the support! Is the reward of Good except the Good? I hope to win the $150 Amazon Gift Card and Themify’s Master Club Membership. Love your products! I love this contest! I should be one of the winners because I am a self-taught WordPress master who can send customers to your website for upgrades. I also am a really really really nice person who could use a boost in revamping my business website for 2018. Thank you! As a non profit Jah Mission supports upcoming artists and creative people. Since we do a lot of this work voluntarily we do not have a lot of funds to afford to buy the lifetime package. In case we would win, it will enable us to help more artists establish an online presence as well as contribute to strengthen our community. This is an awesome giveaway, I should win so I can buy presents for my family with the $150 Amazon gift card. I would love to win this giveaway because my sister in law is pregnant and needs help buying stuff for the baby! Great giveaway! I run a small ecommerce business so I can put the gift card to use on needed supplies. Love themify and been a member for close to 4 years now. This would be a great start up for my husbands business website and maybe get new customers which is always a good thing. I hope I win because I love using and believe in Themify’s products, PLUS it’s the holiday season, and I could use a gift card about right now! Thanks for hosting this giveaway!! We want to rebrand our website and we think Themify is user-friendly and great for that! Thanks for the contest…fingers crossed! Themify has been my best option and it still is, it helps me when I need to do some work and maximize the quality of the results when you know what you are doing. I would use that credit to buy some supplies and maybe some new hardware to improve performance. The hell of a giveaway! I use themify since years now. My clients are happy, I am happy. There can’t be more happiness unless I win. $150 discount on Lifetime Club Membership will be very profitable for me. I’m new to Themify world and so much love it. Continue to do excellent work guys! I’ve been using Themify for over a year and just recenlty signed up to the lifetime Master club because I love your themes and plugins so much. Absolutely amazing designs, support and new content every month. Well done Themify… WordPress done right! I’m already a themify user and looking foward to building more sites with Themify. Also looking forward to winning an Amazon gift card! A gift card could always come in handy! I would be thrilled to win! Both my kiddos are in need of new shoes. Thanks for hosting such a generous and fun giveaway! Looking to restart my blog and these would be very helpful with making me successful.Thank you for the giveaway and the information! I am starting to really understand the development of WordPress. and all of it’s features. I would love to have a framework as powerful as this one. I have heard the stories. Whenever I’m planning a new project, Themify is my first thought for a solid design. More often than not I’m able to find a theme that gives me a significant head start in getting the project online. Love Themify! Would definitely not mind a membership. The Amazon gift card would be nice too! Papa needs this…. Great dudes! This is a great offer and generous giveaway. Love the work you guys are doing. I don’t even want the gift cards, I just want the Lifetime membership. New to Themify and super interested in these templates. I have several sites and I’m rebuilding one for FJ Ministries in Kona, HI. They’re wanting a new fresh look and Themify themes are at the top of the list. It’d be nice to win something for once. It’s giveaway time again! This is why people love Themify. Not only their themes are awesome and tempting, but they are very generous as well. I hope Themify will be very successful with their business in the future. I don’t care if I win this giveaway or not, their acts of kindness deserve positive thoughts from everyone. I should win the give away so I can help my financially struggling parents. That’s the only reason. wanna free my creativity, wanna free my boundary, so i need this, seriously. Pick me pick me! I’m completely broke-a$$ at the moment and it’s right before Christmas. Eek! I could sure use that voucher for some Christmas presents! I hope i win, and i start to thinking that simply i become a nomad in WWW. Themify has been great to use for my websites. 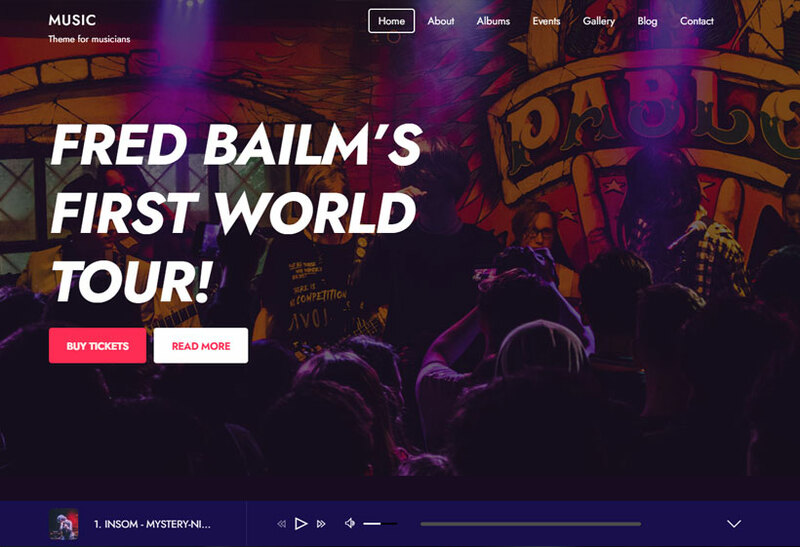 It is super easy now to make landing pages with the music theme. The new cheetah builder is so snappy. I started using child themes and love them. You can pretty much do whatever you want. I got to say their support department is one of the best I have ever been involved with. Its like having developers in my pocket if needed. A+ and highly recommended. We should definitely win, look what we do with your themes! I renew every year…. would be a nice win! Great giveaway, I would like to use Themify Themes on my next Projects. En Colombia queremos usar themify!!! I’d love to win because I have a best friend that could totally use the Themify membership and two kids that would benefit from the $150 gift card!! Hope to create more sites with Themify! Have been using Themify products for our customers and we all are really pleased with awesome products and fantastic support you guys have been providing to us for the last couple of years. Thank you Themify! I am using this and I feel its very easy to create a website just because of themify. This is a great opportunity for all to participate in the good giveaway. 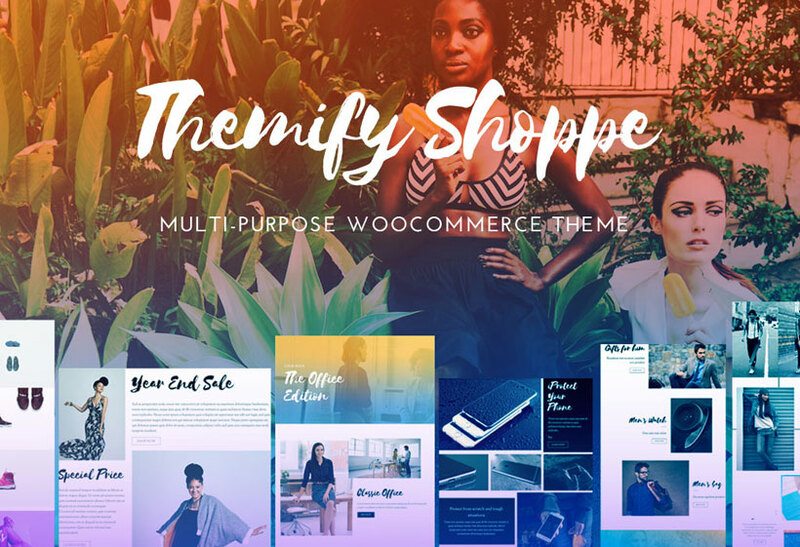 I’ve been using Themify themes and plugins for all my web clients and have tried other themes but none offer the great customization options you have. I’d like to win to help pay for Christmas gifts! Such an awesome contest! I love Themify and use it for all my projects! Anyway good luck to everyone! will use it it multiple projects. I could totally use this giveaway! Thank you for the chance to win a product I love! I love Themify! I have been using your templates for years, and I am absolutely in love with your new themify builder plugin. One of the best, easiest to use, and least buggy of all the builders I have ever tried. Thank you for continuing to develop your products for web designers like me! First of all, thanks themify for the discount. Your themes have enabled us the non-coder people to develop a website in a very easy and fast way. Why should I earn the giveaway let me think, I have done nothing extraordinary but yes I do suggest people to try themify themes and use for their website . So that surely keeps your company grow and generate revenue and you keep developing these awesome products. Hope to have a long journey with you people. Thanks once again. Let us know what you think. If these don’t match your preference, feel free to send us some sample site layouts that you’d like to replicate here – https://themify.me/contact and we’ll look into providing you with a better recommendation. 150 $ amazon gift cards are really awesome thank you !! Great discount sale…! I bough new product for only this sales, because it’s provide cheap price. So I am waiting every time for this sale only. Neat. Anything for Cyber Monday?